Hospital-grade s-class filtration system captures allergens like dust, mold, and pollen with 99.9% effectiveness down to 0.3 microns. Easy-change bag with hygienic seal so that no dust can escape. The electrostatic micro-exhaust filter cleans the air, suppresses motor noise, and comes in four unique, colorful designs. Hospital-grade s-class filtration system captures allergens like dust, mold, and pollen with 99.9% effectiveness down to 0.3 microns. Easy-change bag with hygienic seal so that no dust can escape. The electrostatic micro-exhaust filter cleans the air, suppresses motor noise, and comes in four unique, colorful designs. User-friendly – easy to use & maintain. Telescopic handle with adjustable height for easy use, storage, and carrying. Protective handle bumper saves your walls from damage. Turning swivel neck provides superb maneuverability for cleaning under and around obstacles. Flat-to-the-floor profile for easy cleaning under furniture and beds. Variable power control on ergonomic handle lets you adjust suction for gentle or aggressive cleaning. Detachable suction unit is ideal for cleaning stairs, car interiors, or upholstery. Instant use hose for hard-to-reach corners, edges, and crevices. Thermal cut-out protects motor from over-heating. Quick-release cord on a hook saves you time. Quick-release brush head for easy removal. 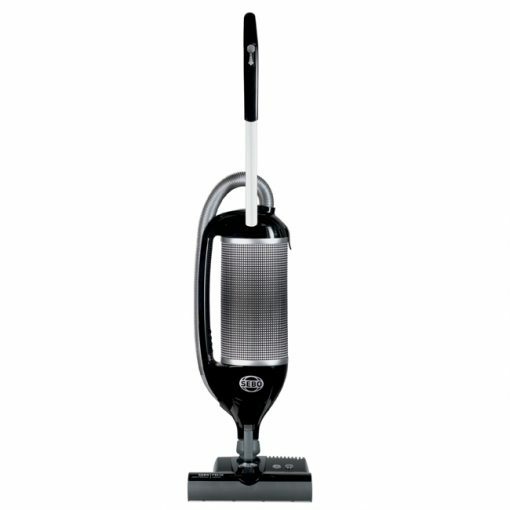 The Felix vacuums come with a premium parquet nozzle, crevice nozzle, upholstery nozzle, and a 12″ ET-1 power head with variable height adjustment, fully rotating swivel neck, a warning light for improper height, a brush roll toggle switch for delicate cleaning, and a head extension on one side for edge cleaning.